Aspen, KSL and Mammoth? Mega-pass and mega-changes to be expected! On Monday July 31st, the acquisition of Intrawest Resort and Mammoth Resort by “KLS Capital Partners” and the owners of Aspen Skiing “Henry Crown and Company” (HCC) has been publicly announced as completed. The new colossus on the ski industry is therefore now shaped by 12 four-season mountain resorts: Mammoth Mountain Ski Area, June Mountain, Bear Mountain, Squaw Valley, Alpine Meadows and Snow Summit in California; Steamboat Ski & Resort and Winter Park Resort in Colorado; Blue Mountain Ski Resort in Ontario; Mont Tremblant Resort in Quebec; Stratton Mountain Resort in Vermont; and Snowshoe Mountain Resort in West Virginia. Its revenue is given by approximately six million skier visits, 20,000 skiable acres and significant land available for real estate development. The deal also includes Canadian Mountain Holidays, the world’s leading heli-ski operator. So, what does this mean for the town of Mammoth, its residents and its skiers? As far as the skiers go, besides expecting improvements in lifts, services and lodges in the next few years, the biggest, expected change will be the giant-all-comprehensive-pass. That will be a serious mega-pass! Who is not looking forward to it!? “Mammoth has been Southern California’s mountain home since 1948,” said Rusty Gregory, chairman and CEO of Mammoth Resorts in a press release. “After doubling down on our offerings to Southern California with the purchase of Snow Summit and Bear Mountain in 2014, joining this new venture led by Aspen and KSL is the next logical chapter in the story of Mammoth Resorts." At any rate, we can expect an increase in the tourism from out-of-state, due to the marketing strategies of Aspen and KSL. It is not news that Mammoth is still considered a “regional resort”, with more dominant ski-states like Utah and Colorado. : besides the fact that it is on the top ten most popular resorts in the nation when ranked by skier visits, it is not a top-of-mind destination resort for skiers not living on the West Coast. Well, that’s bound to change! This is certainly going to affect Mammoth’s Real Estates market. With more buyers looking to buy and invest into the real estate market in town, the market is expected to become more and more competitive in the months to come. Properties with ski in-out access are going to be even more enticing! 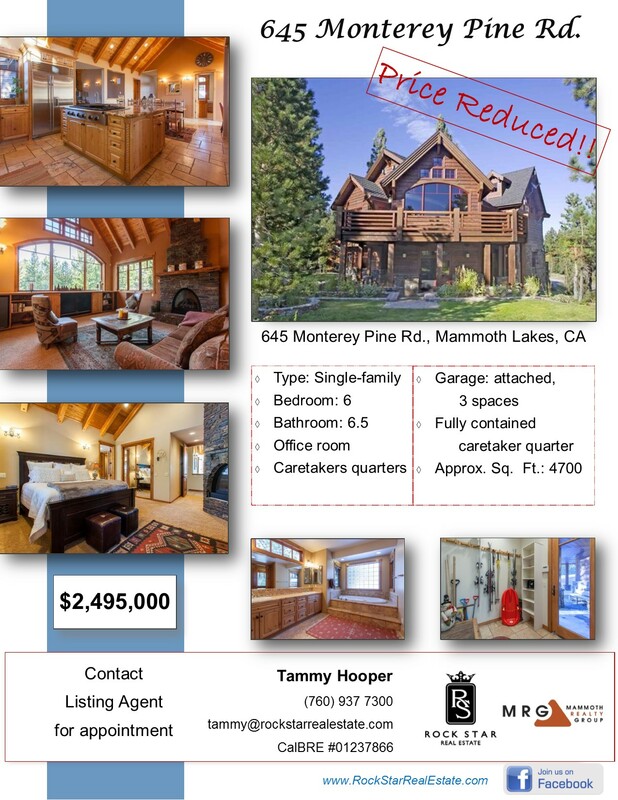 Just an example of desirable Mammoth Lakes ski in/out properties is this amazing one-of-a-kind residence at the Eagle Lodge ski lift, right on the slope side.